A dry cider strain of yeast from Mangrove Jack's! Produces crisp ciders with full fruit character! Perfect for use in the production of a wide range of ciders. A dry ale strain for the production of a range of ales, particularly hoppy beers, from Mangrove Jack's! Produces clean ales where hops come to the forefront. Perfect for use in the production of hoppy beers, but this yeast is versatile and can also produce a wide variety of excellent ales of all kinds! 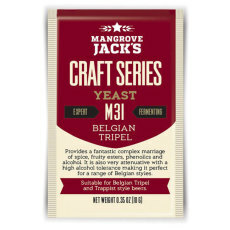 A dry ale strain for the production of high ABV ales from Mangrove Jack's! Produces well-balanced ales with a neutral yeast character. Perfect for use in the production of high ABV beers, this yeast is versatile and can also produce a wide variety of excellent ales! A dry East Coast ale strain from Mangrove Jack's! Produces well-balanced ales, accentuating both malt and hops with a touch of fruity esters. Perfect for use in the production of a range of American and English style ales! A dry saison yeast strain from Mangrove Jack's! Produces crisp and refreshing beers with lovely spice and fruit character. Perfect for use in the production of a range of farmhouse ales and saisons! A dry ale yeast strain from Mangrove Jack's! Produces rich, full-bodied ales with a deep complexity and dark fruit flavors. Perfect for use in the production of Scottish ales, amber ales and sweet stouts, but versatile enough to use whenever a full bodied ale is desired! A dry California lager yeast strain from Mangrove Jack's! Produces crisp and dry lagers that are clean and refreshing, without low temperatures or extended lagering times. Perfect for use in the production of light lagers and pilsners, but is a very versatile strain that can be used to produce almost any kind of lager, as well as cream ale! A dry Bohemian lager yeast strain from Mangrove Jack's! Produces crisp and dry lagers that are soft, with a delicate flavor profile. Perfect for use in the production of light lagers and pilsners, but is a very versatile strain that can be used to produce almost any kind of lager! A dry Belgian Wit strain from Mangrove Jack's! Produces dry, well-balanced Belgian ales. Perfect for use in the production of Belgian Witbiers, Grand Cru, and other specialty ales! A dry Belgian tripel strain from Mangrove Jack's! Produces dry Belgian ales with a great balance of fruity esters and spicy phenolics. Perfect for use in the production of a range of Belgian beers, including tripels and trappist style ales! A dry Belgian ale strain from Mangrove Jack's! Produces dry Belgian ales with a lot of spicy phenolic character and beautiful complexity. High alcohol tolerance in this strain makes it perfect for high gravity Belgian styles such as Belgian golden strong and dark strong ales. Perfect for use in the production of a range of Belgian ales! A dry Belgian abbey strain from Mangrove Jack's! Produces dry Belgian beers with wonderful fruity esters and a restrained phenolic profile.